Last year I enjoyed Edmonton Opera’s production of Beethoven’s Fidelio, my first opera ever. This winter I decided to try out a contemporary opera, Svadba – Wedding, by composer Ana Sokolović, produced by Toronto’s Queen of Puddings Music Theatre and part of Edmonton Opera’s ATB Canadian Series. Svadba is Serbian for wedding, and the opera is sung in Serbian (with English surtitles of course). It is performed almost completely a capella (with some percussive sound effects done on stage), with a cast of only six singers, four sopranos and two mezzo-sopranos. 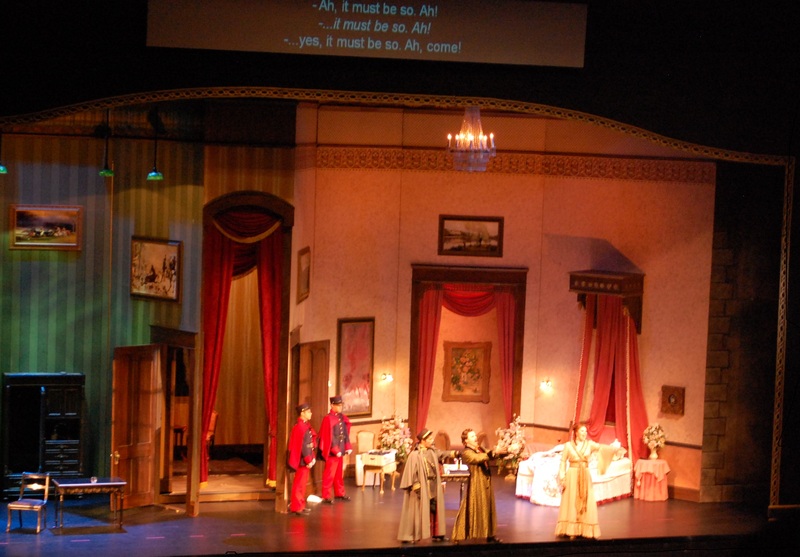 The show didn’t really seem to have conventional linear storyline, but was rather a series of songs sung by a bride and her group of female friends throughout the night before her wedding and as she finishes preparing in the morning. In one of the songs the bride, Milica, seemed to be saying that she wanted to marry Ilija but her mother was giving her to Jovan, but I’m not sure I understood that right since the later wistfulness and farewells could have just easily been a sort of farewell to unencumbered life with friends. The close harmonies and impeccable timing of the singing were impressive. I don’t know enough about music to tell why they worked so well, but Mark Morris’ review from the Journal explains some. I was surprised before the show to see that there was a conductor, because I had never really thought about whether a conductor in a fully orchestrated opera would be directing the singers as well as the instrumental musicians. 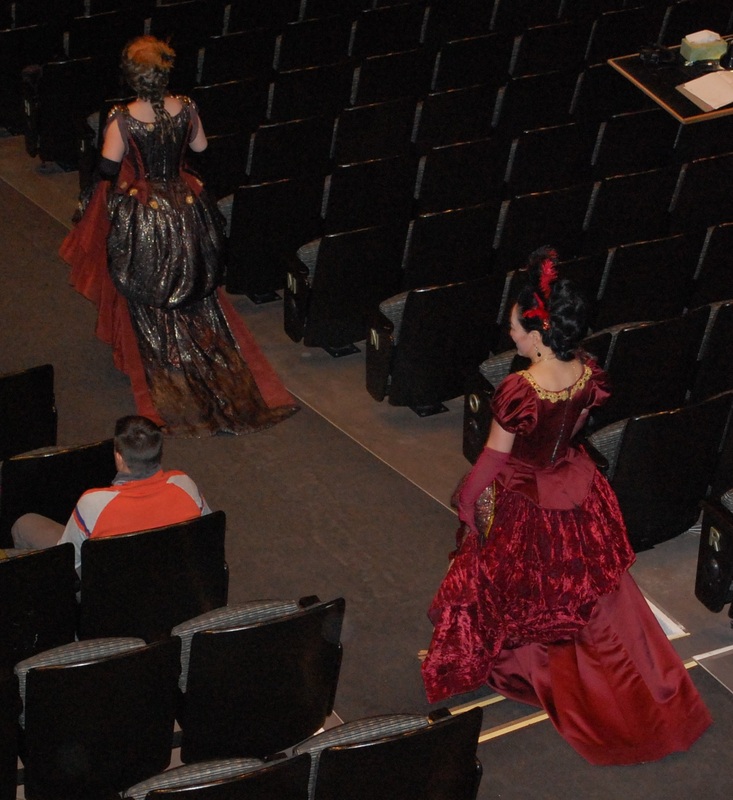 The costumes were all black and red: flouncy short dresses, corset-inspired tops, and leather in a combination with both folkloric and modern allusions. There was a lot of magenta-toned lighting making the reds harsher, and some effective dramatic use of other colours in a couple of songs. Good use was made of interesting props enhancing the mood and imagery. There are two more shows, Friday and Saturday night at C103 (the space on Gateway Boulevard formerly known as Catalyst Theatre), and probably not many tickets left. My own operagoing experience was marred somewhat by an inconsiderate fellow patron who chose to occupy two seats until the last minute before the show, but I gather from the conversation that I couldn’t help overhearing that she’s gone back to Toronto now so you shouldn’t have that problem. This entry was posted in Opera and tagged opera, svadba, wedding on January 17, 2013 by Ephemeral Pleasures. I’d noticed before that sometimes food businesses with a holiday rush sometimes close for vacation in January – bakeries, restaurants, vendors at Strathcona Farmers’ Market. But I’d never noticed before this year that theatres and performance spaces might also be dark at the start of the year. It seems a little counterintuitive that there isn’t much to watch between Christmas and New Years, when people with academic schedules might have time off and be done their pre-Christmas to-do lists, but it does make sense for performers to take a break after New Year’s, when it’s cold and dark and the viewing public might be feeling frugal or unsociable. Both Rapid Fire Theatre and Die-Nasty were dark between Christmas and New Year’s, but then jumped right back in to their weekly entertainments. Rapid Fire is now filling up Ziedler Hall for many of their Friday-night and Saturday-night shows, so fans should buy tickets on line or line up early. Other companies have been in rehearsal, meaning that several shows are opening this week. The new Canadian opera Svadba, in Serbian with English subtitles, is playing at C103, the space formerly known as Catalyst Theatre. Azimuth Theatre previews Free-man on the land at the Roxy starting Tuesday (tickets here). A Clown Double Bill opens Tuesday at The TACOS Space in that awkward bit of neighbourhood that nobody can decide whether to call Ritchie, CPR Irvine, or “you know, behind Wunderbar, there” (tickets through Tix on the Square). Westbury Theatre, Transalta Arts Barns, welcomes the musical Legally Blonde starting Wednesday. Deep Freeze Festival wraps up (see what I did there) today, Ice on Whyte sparkles in a couple of weeks, and ForkFest fills up January. So if you’ve been hibernating the last couple of weeks, it’s time to bundle up and check out what’s happening in Edmonton entertainment. This entry was posted in Festivals, Food, Opera, Theatre and tagged clown, free-man on the land, improv, legally blonde, musical, opera, svadba, theatre on January 13, 2013 by Ephemeral Pleasures.